In the February 25, 1993, edition of The Valley Forge, our own Dave Costello wrote a feature article about an RVC alum who was pursuing a career as a stand-up comedian. The former student, Chris Johnson, had just won the Jay Leno Comedy Challenge, a local contest for comedians that entered him in the national contest for a chance to appear on The Tonight Show. Costello wrote the article for a journalism class at RVC and his professor asked if The Valley Forge could publish it. The professor also later submitted the story for the Illinois Community College Journalism Association awards where it won first place in the Bi-Weeklies Features category. 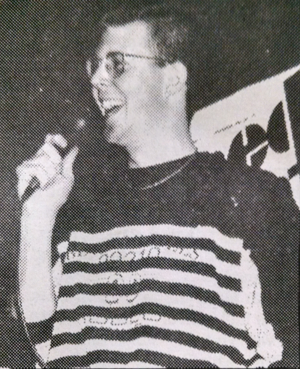 RVC alum Chris Johnson performing his stand-up comedy at The Quark in 1993. In May of 1993, RVC student Kate Sweet received the Gene Albert Streitmatter Excellence in Technology Student Award. The award was presented to Sweet for both her academic achievements in computer-aided mechanical design, but also for overcoming significant obstacles. Sweet started her educational journey at RVC through RVC’s Dislocated Workers Program in 1991, but at age 33 she was very afraid of going back to school and leaving behind her rural lifestyle working on a hog farm in Durand. By the time Sweet won this award in 1993, she had overcome her fears and was on track to receive her associate degree while also coordinating RVC’s new summer technology camps. Kanwal Prashar won the prestigious “Touch a Life” award from the Alpine Kiwanis in May of 1993 for his extensive work helping others. He was recognized for his work with youth through RVC, the Kiwanis and the India Association; service to the elderly as a member of the Golden Agers Center board and service to the needy by organizing a Thanksgiving basket program. Professor Prashar began teaching sociology at RVC in 1972 and officially retired in 2007. He is a professor emeritus and still teaches sociology and philosophy as a part-time adjunct instructor at RVC. The Rock Valley College Center for Learning in Retirement opened in the Fall of 1993. 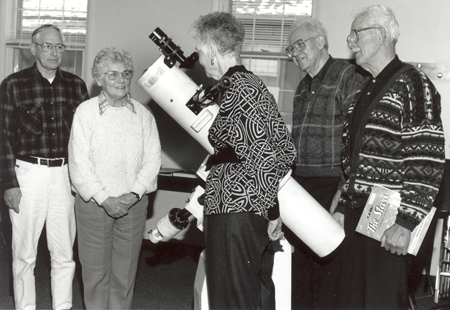 The CLR was created to help occupy and stimulate retired seniors and in 1993 offered five classes (creative writing, personal finance, area history, theater arts, and a trip to Anderson Gardens) to its 100 charter members. Today, the CLR has evolved into a resource dedicated to lifelong learning for men and women age 50 and up with roughly 350 classes annually and a membership over 2,100! Sara Skaggs was the founding director in 1993 and held that position through 2008. In 2013, the CLR celebrated its 20th anniversary. If you would like to read more about the history of CLR as well as some interesting facts about the center from over the years, you can read the program from the CLR 20th Anniversary event. A photo from a CLR class in the early days of the program. 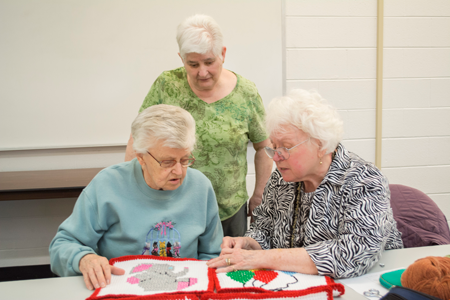 A more recent photo of CLR’s “Nimble Fingers” class that includes knitting, crocheting, quilting, and embroidery. 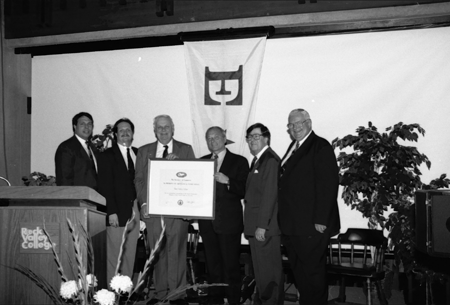 On October 28, 1993, Rock Valley College became the first community college and only the sixth educational institution to receive the President of the United States “E” Award for Excellence in Exporting since the award’s inception in 1961. The nation’s highest award to honor firms and organizations for their contributions to exporting was created by the President of the United States and awarded through the U.S. Department of Commerce. RVC was selected because of its extensive programs that served the needs of exporters and because of the remarkable growth in exporting in the Rockford area at that time. The Rockford area increased its exporting from $19 million in 1986 to $165 million by 1993. Stanley Bokota, director of the Chicago district office of the U.S. Department of Commerce/International Trade Administration, presented the award to RVC President Karl Jacobs at a special ceremony on the RVC campus. At that time, RVC offered an exporting education program that consisted of three classes: How to Sell Overseas, the Export Clinic, and the Documentation Seminar. 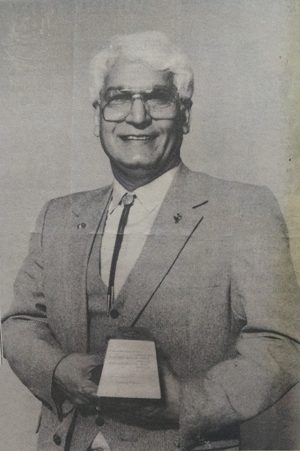 Stanley Bokota presented the President’s “E” award to Dr. Karl Jacobs on October 28, 1993. RVC Board of Trustees member Randy Schaefer is pictured to Dr. Jacobs’ left. Thirty years after the tragic assassination of President John F. Kennedy, one Rock Valley College class in November of 1993 was still seeking answers. Jack Rabito, a veteran radio newsman who lived in Dallas for a decade, led the two hour class of 30 students through the many plots and subplots, facts and theories surrounding the demise of “Camelot.” Since 1978, Rabito had been interviewing witnesses and reading countless accounts of what happened on that fateful day of November 22, 1963. A 1992 Time/CNN poll showed that three-quarters of those surveyed believed Americans had not yet been told the truth about the assassination. That belief has not changed much, if at all, and the nation remains fixated on the event. Twenty years after Rabito’s class was held at RVC, on the 50th anniversary of the assassination in 2013, America remained fascinated. To commemorate the event, the History channel took to Twitter and sent tweets throughout the day as if it were November 22, 1963 and what it might have been like if Twitter existed. 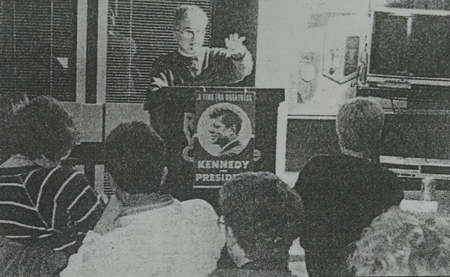 Jack Rabito led a class at RVC in 1993 on President John F. Kennedy’s assassination. 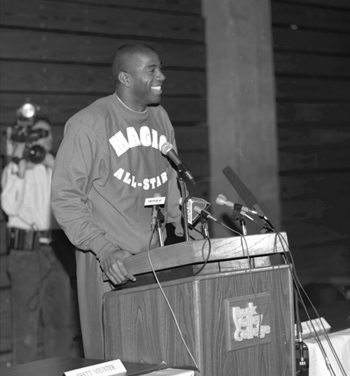 NBA legend Magic Johnson held a press conference at the Rock Valley College Physical Education Center on November 30, 1993, to unveil his “Magic All-Stars Tour.” Approximately 20 members of the media were on hand, including reporters from the New York Times and ESPN. Rockford was the first stop on Johnson’s U.S. leg of the tour as his all-star squad was preparing to take on the Rockford Lightning on December 1, 1993, at the Rockford MetroCentre. At the press conference at RVC, Johnson was very complimentary of the reception he received at RVC. “The people in the Midwest are real gracious,” Johnson said. “They’re real people.” The “Magic All-Stars Tour” was developed for entertainment and to support the CBA (Continental Basketball Association), but also to give some aspiring players a chance to play with a legend like Johnson as well as other NBA talent like Reggie Theus and Jack Haley.